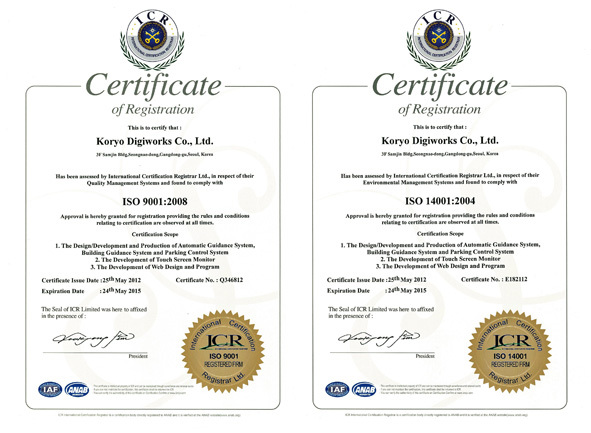 KORYO DIGIWORKS certified ISO 9001 and 14001 for kiosk system, design/manufacturing touchscreen, and developing web program from ICR International Certification Registrar. ISO 9001 and ISO 14001 are international certification for general requirement of quality and environment management. The valuation basis is whether the products for customers and service system satisfy a condition and in upkeep consistently. By this, certified companies are evaluated as they secured the inside management system and customer confidence basically. Koryo Digiworks has exerted to manage the customer center for each products and to improve the customer service, Also they have concentrated on high-rating of customer assessment and company assessment for quality management and management innovation. Koryo Digiworks is slated to apply this certification for Russia, Japan and other abroad projects.